puts perfection in the work. There are many quotations about how lucky a person is when they love the job they do. I completely agree. I’ve known since childhood that making art was my favorite way to spend time. Along the way I’ve explored many different methods and media in search of the one that fits me. What an indulgence! But if my art inspires or intrigues or brings joy to others enough so that they are willing to pay me for it then I’m incredibly lucky. And if that buys the groceries, then I get to call it work. Sometimes though, the complexities of living daily life are overwhelming. It becomes very difficult to focus on the art work. When that happens, there is a solution. Get thee to an artist’s residency. A residency in such a place as the Vermont Studio Center, (VT), or the Wurlitzer Foundation, (NM) or Centre d’Art i Natura (Spain) are fabulous retreats where you are expected to do nothing but your own work. The only distractions are what is bouncing around inside your cranium. Unless of course you enjoy the company of other artists and writers who are dancing with their own muses. But that’s okay. They understand you. You understand them. You chat over meals and then get back to work. And if you don’t feel like chatting, they understand. There are lots of places… most have scholarships at varying levels. Some are invitation only. Some have a small fee, some are quite expensive. Many of our national parks have residencies. Those often have a teaching or exhibition component. Residencies exist all over the world. 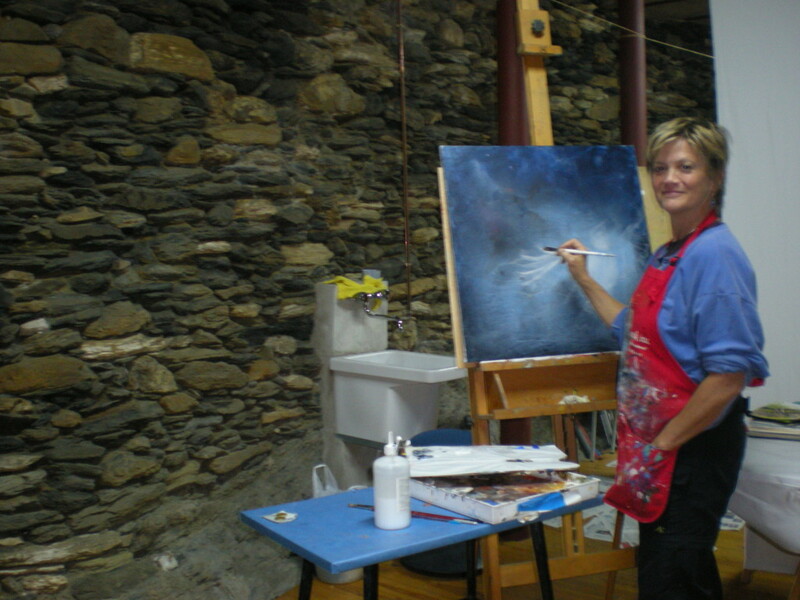 Click HERE for a great list, but there are many lists of artists’ retreats on line. There is undoubtedly an application process that can be quite lengthy, so you need to plan well in advance. I began my nest series during a residency at the Vermont Studio Center several years ago. The Studio Center is a refuge that allowed me to clear my head and move forward with new intensity and focus. There were artists there from Korea, Mexico, Japan, Italy, Argentina, and many US states. What a gathering of creative energy! I would love to go back, and someday I’m sure I will. Hope Entwined V is part of a series that began at the Vermont Studio Center. Having the time to work with no distractions is invaluable. The painting is now on its way to Gallery 203b on Canyon Road in Santa Fe, New Mexico. Go visit it there!